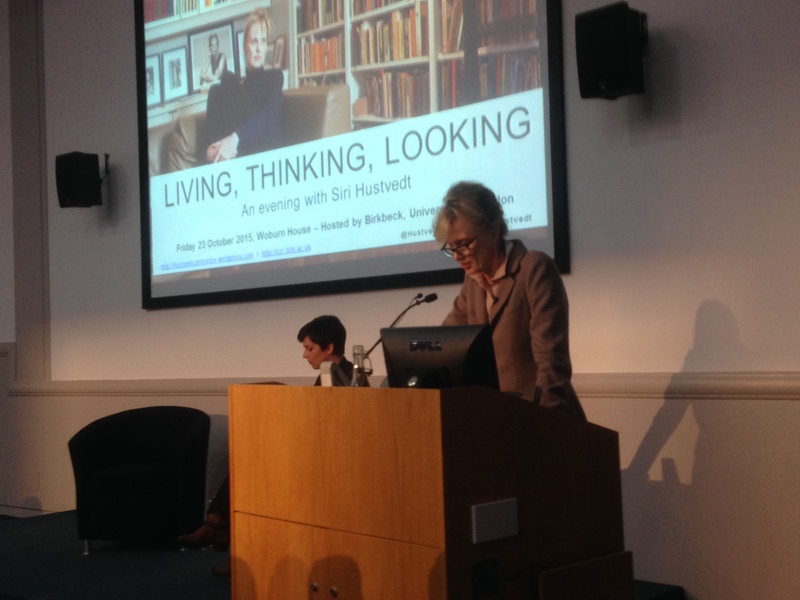 Living, Thinking, Looking – an international conference on the writing of Siri Hustvedt took place at Birkbeck, University of London on 23 October 2015. During the day over 80 academics, students, writers and readers squeezed into the Keynes Library at Birkeck’s School of Arts for the first academic conference dedicated to her work (listen to the morning and afternoon sessions). Later that day, over 150 guests attended a special reading by Ms Hustvedt at Woburn House in conjunction with Bloomsbury Festival (watch the video). A full report from the conference, a blog in the Times Literary Supplement and a special Birkbeck blog are now online. The papers delivered by Dr Ruth Charnock and Diana Wagner appeared in the January 2016 edition of Alluvium. You can also hear Siri Hustvedt talking about the conference and her writing on the Birkbeck Voices podcast. A huge thanks to all our conference contributors, but especially our keynote speakers: Professor Dr Hubert Zapf of University of Augsburg, Associate Professor Christine Marks of LaGuardia Community College (CUNY) and Dr James Peacock of University of Keele. Special thanks to Dr Johanna Hartmann of University of Augsburg for her chairing of the evening discussion. And of course – a huge thanks to everyone who attended, tweeted about or supported the conference in any other way. You can view all the tweets and images from the day on our Storify report. To find out about future events staged by Birkbeck, University of London’s Centre for Contemporary Literature, visit the CCL website.